A charming pattern that was published in the 1930s serially in newspapers by the Nancy Page club. Each week a different block was published; after the quilter collected all she made a quilt; those that appear in the marketplace have varied in color of the birds or the sashing. 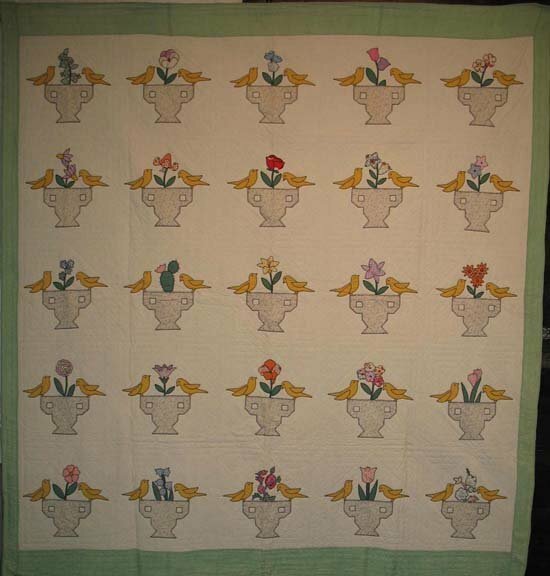 These perky birds perch on the rim of a vase in repeat blocks across the quilt surface. Bordered in a soft ice green color accenting the yellows of the interior. A real find uncommonly wide enough to cover a queen size bed.